Regina is the capital city of Saskatchewan, the second largest city within the province, and the 24th largest city in Canada. It is located in the far southern portion of Saskatchewan on a flat plain near the small Wascana Creek, which was long ago dammed to create the decorative Wascana Lake south of Regina's Downtown area. There are approximately 236,400 people living in over 90,000 homes in the Regina Metro Area, and 215,000 people living in 83,100 homes within the city limits. There are 14 municipalities that make up the wider Regina Census Metropolitan Area including the city of Regina; the towns of Balgonie, Pilot BUtte, Regina Beach, and White City; the villages of Belle Plaine, Buena Vista, Craven, Disley, and Grand Coulee; and the summer village of Lumsden Beach. In addition, the Regina CMA also includes the acreages and country home communities in the regional municipalities of Edenwold, Lumsden, Pense, and Sherwood. Regina is a beautiful city that stands tall in the flatlands of the surrounding prairies and farmland. An abundance of greenspaces and parks including over 300,000 hand-planted trees provide Regina with an appealing streetscape. 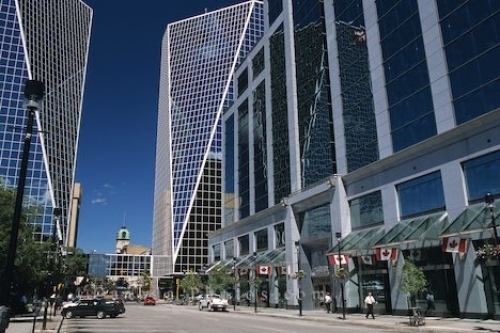 The Downtown area of Regina – sometimes referred to as Market Square – is located in roughly the centre of the city between the Canadian Pacific Rail line and Saskatchewan Drive. The historical heart of the city, newer apartment and condominium construction combined with the construction of several new hotels and the relocation of the Globe Theatre to the Old Post Office is bringing renewed interest in the Downtown area's night life. The Warehouse District just north of Downtown has been transformed over the last few decades, with old and idle warehouses being turned into trendy restaurants, live music venues and loft-style condominiums. The West End, known as Cathedral Area by many, is a mainly residential community west of Downtown featuring the Holy Rosary Roman Catholic Cathedral on 13th Avenue. There are small pockets of larger, luxury styled homes mixed in with smaller-sized houses and walk up apartments in this area, as well as a collection of heritage character homes that have survived the years. In recent years renewed interest in this area has brought infill redevelopment, and many homes have been renovated and upgraded. West of the University of Regina Campus is The Crescents, one of the most popular and prestigious residential neighbourhoods within the city, and made the list of "Best Old Houses Neighbourhoods 2011: City Living" in This Old House Magazine. Its signature half-circle road design is easy to spot on maps, and many of the high end homes in this area are heritage houses from the 1920s with Tudor stylings. In Regina's east end is an eco-friendly community, The Greens on Gardiner, a distinctive area where energy-efficient green home construction is encouraged. This distinctive area features over 40 acres of park area with walking paths and an environmental reserve. Newer residential subdivisions are located primarily on the north and east outskirts of the city. The communities of North Argyle Park and Engelwood on the north side are newer, family-focused communities with local public schools and a community centre. Other family oriented communities with Regina include Lakewood, Maple Ridge, and Rochdale to the north west; Glencairn, Glencairn Village, and Parkridge to the east; and Sherwood Estates, Mount Royal/Rosemont, and McCarthy Park to the west. 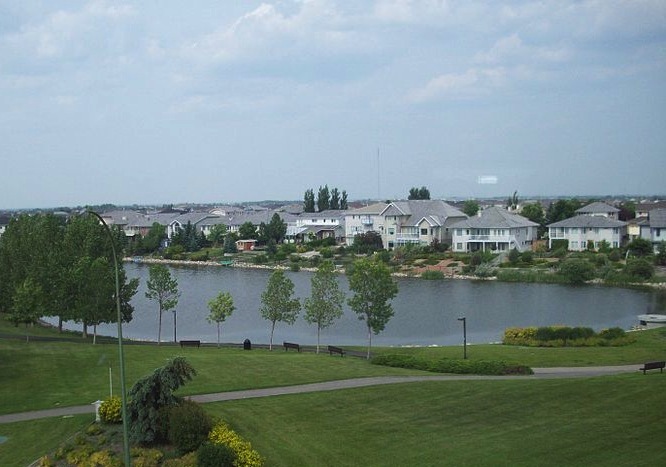 Luxury homes can be found in The Creeks, a newer subdivision in south east Regina, and in Varsity Park, Richmond Place, and Wascana View in east Regina. Get better acquainted with the city of Regina: visit the city website, read about the city's history, and learn more about the city's government, services, transportation and major events. Regina has a wide variety of shopping options, from large shopping malls to boutique shopping and farmers' markets. There are several excellent post secondary options in the city, including the University of Regina. For a mid-size city, Regina has a high percentage of natural parkland, ranging from smaller local neighbourhood parks and playgrounds to the acres of greenspace around Wascana Lake located in the south central portion of the city. In total, Regina has more open space per person than in any other major Canadian city. Wascana Centre is the central park feature in Regina. Located in the south eastern portion of the the city, this 2,300 acre urban parkland has been designed to wrap around Wascana Lake and provides city residents with lush greenspace, boating access and many other summer activities. In addition to many parks, playgrounds, beaches and recreational facilities, many of Regina's most popular attractions and cultural areas are located around the Wascana Lake, including The Saskatchewan Legislature grounds, the Royal Saskatchewan Museum, the Saskatchewan Science Centre, the MacKenzie Art Gallery, the University of Regina, Conexus Art Centre, and the First Nations University. Victoria Park in Downtown Regina is used throughout the summer to host many popular events and festivals, including the annual Regina Folk Festival. In the far south east corner of the city is the brand new McKell Wascona Conservation Park, a 171 acre natural area dedicated to the preservation of native prairie wetland habitat featuring 4 kilometres of walking trails around the Wascana Creek. The city of Regina operates five public golf courses, including the Tor Hill and Murray Golf Courses near Kings Park just a few minutes north east of the city. Playgrounds and spray parks are located throughout all quadrants of Regina in family residential areas, and the city has both indoor and outdoor skateboard parks. Regina has more green space per person than any other major city in Canada, and has dedicated a huge area in the heart of the city to parks and recreational facilities. Golfing is a very popular pastime in Saskatchewan, and Regina has many excellent golf courses within the city. 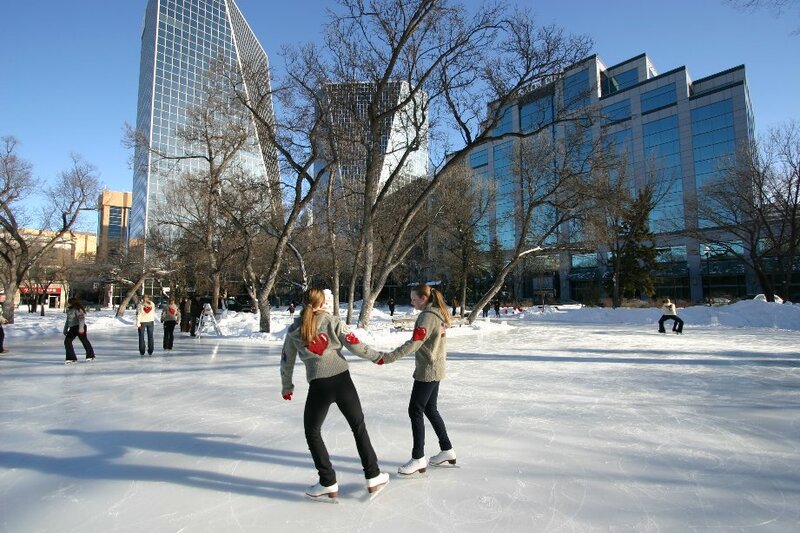 Winter may be long in Regina, but there are plenty of winter activities in and around the city to enjoy. Named the 2004 Culture Capital of Canada by Heritage Canada, Regina is known for its arts and culture community including a wide variety of annual festivals, many art galleries, a premier dance company, and popular local theatre performances. The Conexus Arts Centre is home to the Regina Symphony Orchestra, the oldest continuously performing orchestra in the country, Opera Saskatchewan, and the contemporary dance company New Dance Horizons. This historic Old Post Office in Downtown Regina is now home to the prestigious Globe Theatre, the largest professional theatre company in the province. Annual festivals include the Regina Folk Music Festival, the Craven Country Jamboree, a Dragon Boat Festival, the Cathedral Village Arts Festival, and the well known Mosaic Festival. Held every year in June, Mosaic is a celebration of multiculturalism in Regina that sees pavilions erected around the city featuring food, performances and artifacts of all the individual cultures that make up Regina's heritage. Night life hot spots in Regina include Downtown's Casino Regina, and a selection of clubs and restaurants in the Warehouse District. Trendy boutique shopping can be found during the day in the Warehouse District, and also in Cathedral Village just west of the Central Business District. Big box and brand name stores can be found throughout Regina's three premier shopping malls, the Southlands Shopping Centre, Northgate Mall, and Cornwall Centre. Regina is home to the popular CFL team the Saskatchewan Roughriders who play at Mosaic Stadium, and you'll find no football fans more loyal than Riders fans. Games almost always sell out, and season ticket holders will regularly drive three or four hours just to watch their favourite team play. There are many things to see and do in the city of Regina. We have the longest running symphony in the country, a pro CFL team, and many other arts institutions, night spots and tourist attractions. Regina values its rich, diverse heritage and culture, and has several excellent museums within the city. S. A. C. H. M.
Many famous Canadian artists have come from or been featured in some of Regina's galleries. Both residents and visitors of Regina enjoy the many festivals and events that happen annually in the city. Reginans are known for being avid sports fans, and cheer for professional and amateur teams.